Syracuse: Last Mass for Great Gothic Holy Trinity Church - What Now? Its not been an easy month for Gothic architecture in Syracuse. In addition to the request by the City Department of Code Enforcement to demolish the Gothic Cottage on South Salina Street, the city witnessed the closing of Holy Trinity (Roman Catholic) Church at 501 Park Street on the North Side. Holy Trinity, built from 1905 to 1912, is one of Syracuse’s most impressive Gothic Revival buildings. The closing of the church was announced in December, together with the pending closing of Saint John the Evangelist Church, another great Gothic building that once served as the city’s Catholic Cathedral. Last Sunday the final mass was celebrated at Holy Trinity. You can read about it here. At the turn of the 20th century the Northside as home to many German Catholic and Lutheran churches and many of these were Gothic, a favorite style among German-American immigrants beginning in the 1840s. Most are now demolished or transformed to different use. For at least the last half century the identity of Holy Trinity has been Italian, those more recently new parishioners include Vietnamese Catholics. Whatever their national origins the great German-Gothic hall style church has been a landmark of architecture, community and faith in the neighborhood. Its tall two towered façade, augmented by its siting on a local highpoint, soars above other buildings in the area. It is the most impressive building of any sort in that part of the city. Its future is unknown. The track record for reuse of Catholic churches is not good. Until recent years the Catholic Church has been loath to close churches, and for many generations replacement populations of new Catholic immigrant groups have made reuse unnecessary. So far, Catholic churches have not been offered for use to other Christian denominations or religions. [n.b This has changed with the sale and reuse of St. Peter's church on James Street -- SDG 10/29/12]. This building, though, is still in very good condition. When I visited a few days before the final mass, the only areas in need of repair that I could see were small patches of deteriorated plaster from water damage in the west tower stairwell, and those seemed to be dry, indicating that the source of the damage (which was probably bad drainage off the roof) has been repaired (n.b my visit was limited to the sanctuary and choir loft). Thus, this closure is not comparable to that South Presbyterian Church where significant repairs were needed, but had been put off for a long time by the small struggling congregation. Holy Trinity Church exterior views from Park Street. All photos: Samuel D. Gruber 2009Nonetheless, Holy Trinity (or whatever name it will assume) will require considerable maintenance no matter what its future. But no one should be allowed to make the argument that bad condition requires demolition. But as we know from so many similar situations in Syracuse – leaving a building like this empty for even one or two winters can cause great harm – from ice or thieves! It is not clear that care of the building was really putting a strain on the Diocese now, but looking ahead it was decided that resources would be put to other use. There does not seem to have been any large appeal for help or public fund raising effort. The church has not received – nor to my knowledge ever been nominated – for any public or private grants. According to parishioners, the church was built with contributions without a mortgage, and the title holder was actually a local religious society, not the Diocese, but that does not seem to make a difference in the present situation. Still, a group of parishioners is appealing to the Vatican for reconsideration of the closure and the merging of Holy Trinity with Saint John the Baptist Church located further west on Court Street (that building is an impressive Romanesque Revival structure, built by famed Syracuse architect Horatio Nelson White in 1867, and oldest (?) church in the city in continuous use). The interior of the structure is quite striking. The big open space is impressive. In the German tradition there are no low side aisles. The considerable height is maintained across all three aisles for the entire width of the church. That means there are no side galleries, just a choir loft open the entrance narthex (vestibule). The great open space accentuates the light, color and line of the excellent set of narrative stained glass windows. These are of German origins – I’m not sure of the studio – but they certainly rank among the very best (that I know) in Central New York. [n.b. These are in German style, but in fact are signed works of Buffalo stained glass virtuoso Otto Andrle and his studio - SDG 10/29/12]. I was particularly taken by a Garden of Eden scene, and there are many other scenes that strike me as unusual. The windows are inscribed with passages and mottos in German. I don’t know if these windows were documented by the Census of American Stained Glass. I suggested to parishioners that no matter the outcome of their appeal, it is essential to document (and protect) these windows. I will try to get some of my art historian and religious studies friends at Syracuse University to participate. I have not seen early documents and as of this writing I do not know who the architect was – though he was clearly very competent, and he was aided by some first rate plasterers who carried out all the interior decorative work, especially the capitals. The building is probably brick throughout - with the interior covered with plaster roughed and painted and scored to look like ashlar stone blocks. I assume the vaults are a plaster, but it would be good to get up in the attic to take a look at the vaulted ceiling from above. The original altar - set in a tall and intricate work of Gothic style cabinetry with panel paintings and set against the south wall (end of the main apse) is also tremendously impressive. Given my other (Jewish) studies I was interested in the painting of the so-called Sacrifice of Isaac on the altar, included as a prefiguration of the Crucifixion. Here are many photos taken in December 2009 that show the seriously deteriorated consition of the building taken when SUN accompanied Code Enforcement inside on December 15, 2009 (first 24 photos taken by SUN, the rest taken by Code.) http://www.flickr.com/photos/sunvacants/sets/72157623343165781/. Some of the mess is just that - mess, and a lot of wha is shown to be deteriorated and ruined are later insertions - 2 x 4 separation walls, 1950s style paneling and the like. Many original details including floor sections, moldings and the spiral stair are intact. Still, there is much damage in walls and ceilings and most significantly in the foundation. It appears that the foundation would have to be substantially rebuilt - though it is not clear from the pictures whether the deterioration is under all the foundation or just the newer additions. It seems to me the first thing to do before demolishing the building in toto, would be for the city to bring in a dumpster and authorize the volunteer clearance of debris as has been done ath the Pike Block. This would surely facilitate good documentation of building - something that need to be done in any case and that the SLPB will certainly require. It would allow the some experts to get in there to look the entire building and determine how difficult any project would be - and how costly in materials and labor. All this assumes permission would be granted by the church which owns the building. Last Chance for South Salina Street Gothic Cottage? Syracuse, NY. 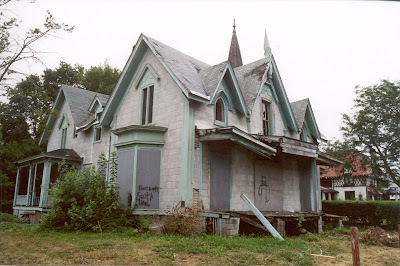 The "Gothic Cottage" at 1601 South Salina Street a few years ago. For at least as long as I've lived in Syracuse (since 1993) every time there is a list - promoted or just stated off-the-cuff - of endangered buildings, the mid-19th century Gothic Cottage at 1601 South Salina Street is included. The small but once intricately detailed house is among the most noticeable structures on South Salina Street in the area once known as Danforth, the important linking settlement between Onondaga (the Valley and the Hill) and Syracuse. The house is the oldest standing building in the South Salina Street National Register Historic District, which was designated in 1986. “It is an architecturally significant example of a picturesque, Gothic Revival style cottage, reflecting the early Victorian era taste for the fanciful, picturesque architecture propounded by A. J. Downing and others in the mid‑nineteenth century. Distinctive characteristics of the period displayed by the Gothic Cottage include the steeply pitched,. cross‑gable roof with pinnacles and pendants, Gothic‑arched windows arid, decorative, label molds above, window openings. The modern siding may conceal board‑and‑batten siding, also a characteristic attribute of the style. Entrance details and interior features, however, reflect the persistence of Greek‑Revival, style building traditions from an earlier period. The deeply recessed door flanked by sidelights and transom light, all surrounded by heavily molded trim, is typical of the Greek Revival style. Inside, the spiral staircase detailing and door and window moldings are also in the Greek Revival style. The house was at one time owned by John A. Clarke, a locally prominent Syracuse lawyer." The house was inhabited until 1978 when it was sold to the New Jerusalem Church of God in Christ (situated on an adjacent property to the south in the former Danforth Congregational Church, built 1884). The Church does not currently maintain the house, and the presumption has been - and this needs to be confirmed - that the Church would like to see the building demolished (since it has followed a policy of demolition by neglect) - presumably to reuse the lot for some other purpose (though they would need a zoning variance for a parking lot) or to sell for income. Clearly, the church has had its own needs to maintain its own historic 1884 building, which was sold by its original congregation for one dollar in 1968. It may be that the Church originally purchased the Gothic Cottage to prevent some other undesirable development on the street. The 1970s was a period of widespread demolitions on major Syracuse thoroughfare and old houses often gave way to commercial buildings. 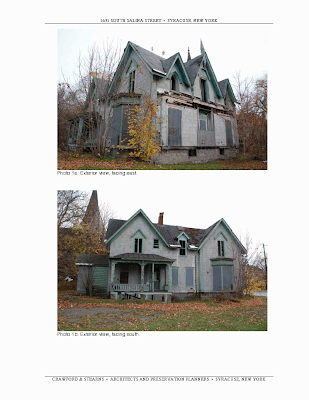 Recent pictures of the cottage from the Crawford & Stearns report. Note the remains of the porch are gone. Sadly, these days the Gothic Cottage is noticeable more for its dilapidated condition than for its past architecture and its always present potential. While there have been some unsuccessful efforts in the past to restore the building, these have all failed, and since 2008 Syracuse United Neighbors (SUN) the active Syracuse community group, has called for the building's demolition. Responding to the charge, the City's Department of Code Enforcement has now begun the process that is likely to lead to the building's demolition. Yesterday, the Department presented its request for a certificate of appropriateness (CofA) to the Syracuse Landmark Preservation Board (SLPB). Although the structure is not designated a Syracuse protected site, its fate is subject to review by the Board because it is a contributing property to the National Register District. The SLPB tabled the CofA request ofr one month, vowing to make a decision then. Still, even without SLPB approval, the Department of Code Enforcement can demolish the building at any time citing it as pending health or safety emergency. . In addition to Code violations, back taxes are now owed on the property (I don’t know how much), but the City has not seized it, no doubt not wanting yet another property on their hands. At the SLPB meeting, of SUN organizer Richard Puchalski called for the demolition on the grounds of the building's extreme deterioration, and because there is no sign of a scenario to preserve the building. Tom Francis, Director of Syracuse Model Neighborhood Corporation (SMN), who a decade ago had tried to obtain state funding assistance to save the building - then in much better condition - also favored demolition. Tom and SMN were the 1998 winners of the Preservation Association of Central New York's Pat Earle award for significant work in the neighborhood carried out in the 1990s. While the house looks bad, it is much less of a danger than other buildings in the city that still stand. Its location, however, and the long wait for some change, has made it symbol of the failure of the city to solve the problem of how to save old buildings. The sad irony, of course, is that the city through Code Enforcement can demolish the building at any time, but it cannot – nor can any other group – intervene to care for the property since it is privately owned. Obviously a clean up of the site and modest albeit cosmetic repairs to the structure would be less than the cost of demolition. The other irony is that in the end, of the building is going to be demolished, it is the city that will pay. But since the property has not been seized, it is quite possible the newly cleared property may revert to the church. the City seizes the property for back taxes and the offers the site for a token sum to a not-for-profit (housing, cultural, religious, whatever) that commits to restoring and rehabilitating the structure with a certain amount of money on hand and cleaning and stabilization work to be down immediately. Then, as a not-for-profit, the group is eligible for public and private grants and private contributions. The group would especially seek contributions in kind from area architects, contractors, suppliers, etc. The project is small enough that it could be done fairly quickly (this could even be our own version of PBS’s “This Old House”). If anyone has any other idea...now is the time to speak up and to act. The condition of the Gothic Cottage is bad, but certainly many historic houses have been recovered from worse. The problems are a almost - money and postnatal use. Despite the loss of the front porch and a debris filled interior, there is still much of the original building fabric, some of which could be restored while some would also have to be replicated. In places other than Syracuse the process is not a difficult one, and one can visit Auburn to see how the old barn at the Tubman House is being saved in such a manner. Preservation Architects Crawford and Stearns, consultants to the City of Syracuse, prepared a report for the SLPB about the history of the building and its current condition. This bit of history is excerpted form the report. The Gothic Cottage …was built circa 1855 and is an important example of the Gothic Revival style. The land the house is on was purchased in 1824 by General Thaddeus M. Wood as part of a larger land holding that he named “Danforth” after his father-in-law General Asa Danforth. The land reverted to the state of New York after Wood was unable to pay for it and in 1843, William B. Kirk purchased the unsettled land and developed the “Kirk Tract”, subdividing the land until his death in 1886. Kirk sold a lot to John A. Clarke and his wife Margaret in 1858, with boundaries defined thusly: “Beginning at a point in the center of the Tully Plank Rd, two chains south of the southbounds of Ridgeway Street, running thence easterly along the southbounds of lands heretofore deeded to John Graff four chains thence, south and at right angles with the last described line, two chains, thence westerly on a line parallel with the first described line four chains to the center of the Tully Plank Road, thence northerly along the center of said Plank Road two chains to the place of beginning.” Mr. Clarke was a prominent attorney in Syracuse. A simple box indication of a structure appears on the 1860 map of the lot and, by 1874, the outline of the house appears to closely match the structure as it is today. An 1892 map indicates the lot as being the “Estate of J. Tolman” and shows the same lot dimensions as previous maps. James Tolman owned a number of properties in Syracuse and Baldwinsville, including 1211 S. Salina Street (1631 prior to renumbering). James Tolman was the brother of Dr. Harvey P. Tolman who also owned property in the area. The lot was divided when given to Abigail Neff in 1905 to its current dimensions. The Danforth Congregational Church was built on the adjoining lot to the south in 1884. The 1908 atlas of the City of Syracuse and the 1910 Sanborn maps show the house further back on the lot, while later Sanborn maps indicate a move forward, in line with other houses on the black. The house may have been moved after an addition was built to the church from 1899 to 1902. Whether the Tolman family was responsible for the move is unclear. There is evidence of a number of building campaigns, although they appear to have all taken place prior to 1910, as the full mass of the house appears on the 1910 Sanborns, and, again, the mass of the house appears roughly the same in the 1874 map. Rot in the interior walls reveals that the back two stories of the house were most likely an addition to the main cottage with center stair and a room on each side as the original wooden roof shingles can be seen under the addition roof. The Lynch Family lived in the house from 1917 to 1948. George D. Lynch was a well-known physician in the area and was married to Irene Hughes. According to Charles Lynch (via a phone conversation in 2005), an attorney in Auburn, NY and the grandson of George and Irene, George Lynch removed the “gingerbread” bargeboard as he felt it would be too difficult to paint and maintain. A photograph of the home taken circa 1917 [in the C & S report] shows the original trim intact on the house.